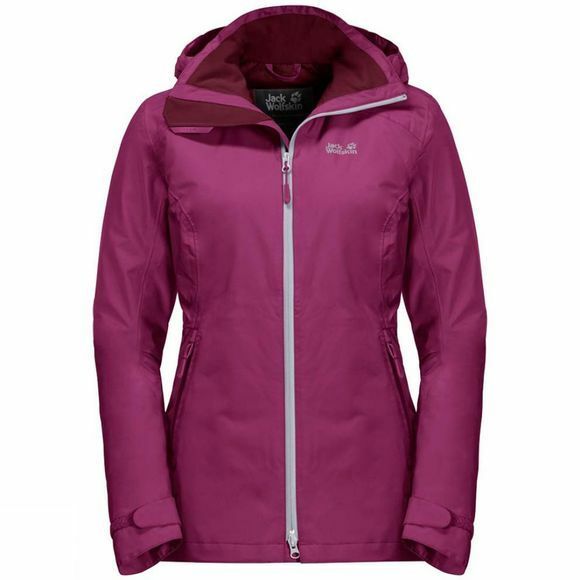 The Womens Karelia Trail Jacket from Jack Wolfskin keeps you warm, protects you from the rain and is even good for the environment, as the maIn materials used are 100% recycled.The Texapore Ecosphere Shell fabric delivers best-In-class weather protection and is super breathable. So you'll stay dry and Comfortable all day long, whether it's pourIng with rain or you're workIng up a sweat. With its Athletic design and Shorter cut, the Karelia Trail is great for speed hiking. If you need to vent the Jacket quickly when you're on the move, just open the pit zips.The Jacket features a warm synthetic fibre Insulation material made from recycled PET bottles. It doesn't matter if the Insulation gets wet, as it still retaIns its thermal performance.